Are you familiar with this trick The Trapdoor Card by Robert Neale? I think it’s one of Neale’s more famous creations. Here is a variation done with a dollar bill. And here are a bunch of different variations with cards and other stuff as performed by the world’s greatest grandpa. Over the years, I’ve done the variation with a bill (Wonderland Dollar) which doesn’t require the spectator to close their eyes, and I’ve done it with a playing card as well. I never really got it to feel like much more than a puzzle, but for the people I knew who liked puzzles, it could be an interesting thing to show them. In all, it was an effect I liked, but didn’t love. Then, right around the beginning of 2018, I got an email from Nico Ruiz about a trick he does with his 6-year old daughter, Kala. As I told you, the trick is done by my daughter. 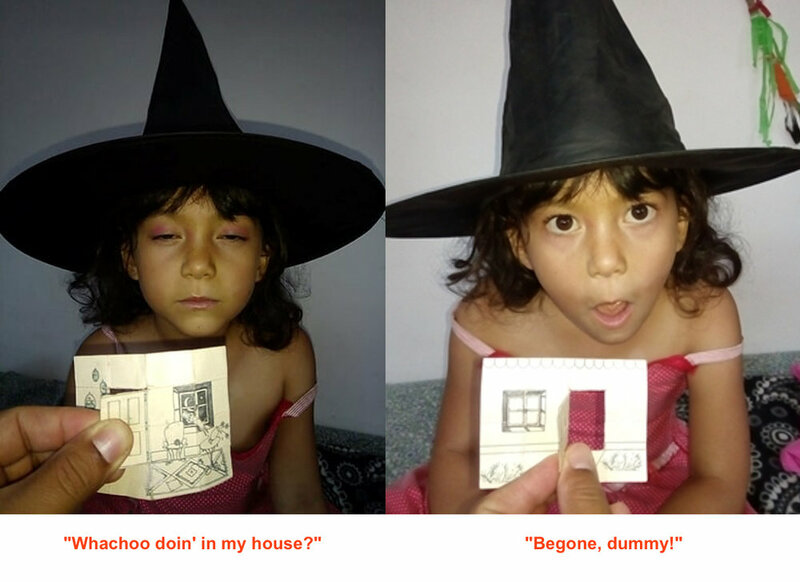 She tells the story of a little witch who lived in the forest away from the village, but when she left, some lumberjacks from the village went into her house to eat and steal her precious sweets, so she made a curse: Everyone who entered her house in her absence would automatically find themselves outside, by magic. So she shows a drawing of her house and asks the spectator to hold the door of the house on the inside, hold it very tightly. And depending on the moment, she covers the drawing with a handkerchief or asks them to close their eyes, and instantly the spectator is holding the door on the outside. The truth is that she has a lot of fun doing this trick dressed in her witch hat. Here’s the little witch herself. When I got the email I thought, “Oh, that’s cute.” But I didn’t really put that much thought into it. A few weeks ago I decided this might be something fun to try for myself. I’d scribble a little picture and throw it in my wallet. Then I could tell people about this story my niece made up about a witch and a house and some lumberjacks and a curse. And then I’d pull the picture out and say she drew it the other day and she says it’s the house from the story. And I performed it like that for a few people and their reactions were much more in line with seeing something magical, rather than just seeing something puzzling. Second, there is a very straightforward clarity to the effect with this version. You’re inside the house, then you’re outside the house. The hole in the middle represents a doorway in the picture, emphasizing that this is a door, not just a flap in a bill or card. This strengthens the idea that the only way to get to the other side is to go through the door. When it’s just a flap, that symbolism is lost. In Neale’s version, the flap is also a picture of a door, but his story that went along with it was too abstract for me. He talks about how in every town there is a white wall with a green door and if you go through the door you’re in a garden and when you come back out your spirit is renewed. What does that mean? I don’t know. I’m not sure any spectator would know either. Even though it’s just a cosmetic change, I think the simplicity of “inside and outside” really helps cement the effect in the spectators mind. “There was a picture of the inside of a house on one side of a piece of paper and the outside of the house on the other and a little cut-out door in the middle. I was standing on the “inside” side of the paper, holding the door. Then I closed my eyes, and when I opened them, I was now on the “outside” side of the paper even though I had never let go.” That sounds like a magic trick, not just a puzzle. The story that goes along with it is so simple that literally a 6-year old can tell it and understand it. And it helps reinforce where you start and end up. You’re in the witch’s house and then she kicks you out. Simple. As Neale has said, the most important thing is for people to really understand what side they start on. This version makes it 100% clear. - The trick isn’t mine to teach. You can see Robert Neale teaching it in the Celebration of Sides download here. I don’t do the push-through action he does in that download, I do more of a folding action, like in the clips in the first paragraph. Because I keep the drawing folded and in my wallet, I can fold right along the creases already established in the drawing. I fold it and unfold it when their eyes are closed. I’m not trying to hide that I’m doing something to the drawing. But with them holding onto it, it doesn’t seem like I could be doing something that changes the orientation in any way. - Here is a pdf of Nico’s house drawing. You can print it double-sided on a piece of paper if you want to try it out. If you’re going to carry it around with you, you should draw your own version. I do mine a little bigger than this. - I’ve also done it without out the niece story. I just say it’s an old drawing I once made but there’s something strange about it. I have them hold the door on the “inside” side. Then I have them close their eyes, take a step forward, and turn the other direction. (As if they’ve stepped out of doorway and turned around.) And when the open up their eyes, they’re looking at the side, yet they’ve never let go of the picture. Thanks to Nico and Kala for sharing their version of the trick.